I got some fantastic news this morning; Blood Pulp Books is now taking pre-orders for Cal McDonald: Detective Tales Volume 1. I realize I just threw a bunch of different things at you all at once, some of the names you may recognize and some may be new to you, so let me slow down and go over just why all of this is a very, very good thing and why I already spent 10 bucks before I finished my first cup of coffee. Bloody Pulp Books is a small book publisher started by Steve Niles and graphic designer Alex Lodermeier. As the writer of 30 Days of Night, Criminal Macabre, Simon Dark, etc…Steve Niles should be a pretty familiar name to F’ing Monkey readers. Don’t think that Bloody Pulp is just going to be releasing comic related books though; their next book is going to be a biography of Lance Henriksen written by Lance and Joseph Maddrey. The book is going to include illustrations by Tim Bradstreet, Mike Mignola, Eric Powell, Bill Sienkiewicz, Ashley Wood, and Bernie Wrightson. How can that not be amazing? Now that we got Bloody Pulp Books explained, we can go on to talk about Cal. Cal McDonald: Detective Tales is a collection of prose stories about Steve Niles’ famous pill popping detective. 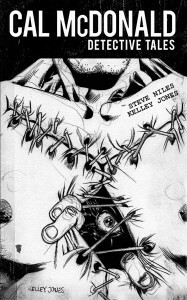 This first volume is written by Steve and will have illustrations by Kelly Jones. The book just went on pre-order this morning and only 2,000 copies of this 84 page beauty are being made. The fact that the website calls it volume one makes be very excited because I haven’t even read the first one yet and I already want more. Now it is possible some people are reading this and saying, Cal who? 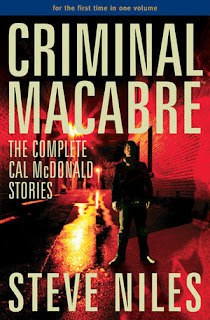 Cal McDonald is a detective who is routinely pulled into the plots of the paranormal. For some reason it is attracted to him and he sees the things that most people refuse to take notice of. Seeing werewolves and vampires will take its toll on a person and Cal copes with handfuls of pills and what ever other drug he can get his hands on. Take one part noir detective, one part horror movie, and blend them together with a handful of speed and you get Cal McDonald. You can find Cal stories in the Criminal Macabre comic book series or in prose. 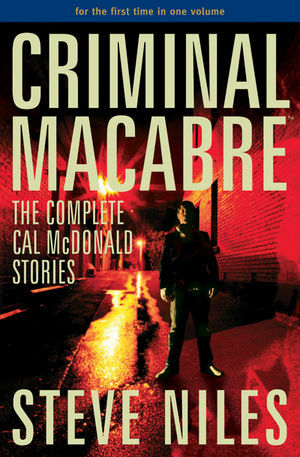 If you’re looking for the prose, they made it easy on you a few years ago and collected it all in a single volume, Criminal Macabre: The Complete Cal McDonald Stories. I seriously can not recommend that book enough.